The ensemble drama has been particularly popular in recent American film. Primary exponents are Paul Thomas Anderson (Boogie Nights, Magnolia), Steven Soderbergh (Traffic) and Paul Haggis (Crash). However, the king of the genre is undoubtedly Robert Altman. These more recent examples offer distinct worlds that are easy to be drawn into, with fascinating characters that we do care about; the difference with Altman’s films is that every person on screen – from the part with the most dialogue, to the guy with a mullet and goatee standing in a huge crowd – comes across as a real person. The others I have seen are Short Cuts and Gosford Park, and it’s that attention to the smallest roles that sets him apart, placing him among the greatest American filmmakers. Nashville, I would suggest, is his finest hour. (Without having seen MASH or The Player I’m not really in any position to judge, but too bad.) No better film chronicle of Americana exists that I’ve seen. All the required elements are present and correct: country music, NASCAR racing, and most of all, the sorts of interpersonal relationships that could only happen like this in America. Husbands and wives in difficulty, for various reasons (extramarital affairs, career overtaking love etc. ); groups of friends in disarray; outsiders regarding the environment with fascination and ignorance, whilst being regarded with (much of the time) utter disdain. I say again, not for a second does any of it seem contrived, not even the famous climax that we know is coming but we still don’t believe will really happen. If for no other reason, it’s all real because it’s unusually unromanticised. 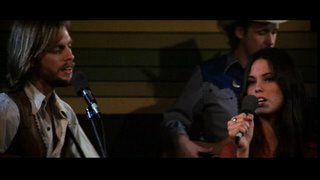 I expected Nashville to be a celebration of the American Dream, and in a way it is, but it is deeply critical of it; from the start it has characters singing about peace, love and understanding, then as soon as the song ends they settle back into their bitter, disagreeable, and troubled persona. Dreams don’t crumble in this film so much as they are denied outright. Everybody wants for more – that great reconciliation, that deserved recognition, that wider success – but it’s always out of reach. Some realise this and some don’t, and it is heartbreaking to watch those in both camps as they either deal with a crushing realisation, or continue to delude themselves. I make it sound like there’s no hope in this story, but there is, and it’s summed up by the fact that the one character who really takes advantage of her big break only gets it through the extreme misfortune of another. That’s to say, outright hope doesn’t necessarily exist: through narrow-mindedness we ignore the flip side of the coin, but it is there, and it might make itself known at the least opportune time. Still, Altman sees the humanity in everyone, and they all come across as sympathetic characters in one way or another. We aren’t perfect! Nobody is! But a lot of us, deep down, have the right things at heart. A simple old message, but rarely better illustrated than it is here. I really liked the way much of this film was shot in medium to long shot – it was another good way of making everyone seem on equal footing. The music is great, too, particularly Haven Hamilton’s opener ‘200 Years’. The acting is excellent across the board, and it would be pointless to pick a standout because there are literally dozens of good performances here. The only slightly troublesome element was that there were so many plot strands that it did get a little bit confusing sometimes… but hey, that’s what second viewings are for. P. T. Anderson, the pretender to Altman’s throne, got Henry Gibson (Haven Hamilton in this film) to play a small role in Magnolia, and that surely is his way of recognising his roots. I imagine there are hundreds of young filmmakers in America and around the world who would cite Altman as an influence. This is another legendary director who has never won an Oscar, and as such he will receive a ‘We Fucked Up‘ one this year. He’s a pioneer, an innovator, a true cinema artist, and those unfamiliar with his work should certainly start with Nashville.